I still have little or no idea about what appears to be several different ways of loading (is that the right word ?) content onto a figure say Victoria 4. 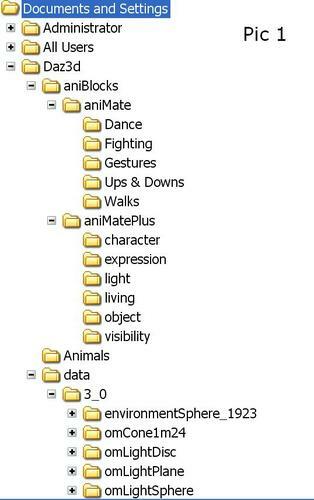 There's words like loading, inject, morph, metadata file, obj. and sometimes I find I can copy and paste it across as well all of which has left me very confused. You load load the figure first, then select the clothing for that figure in the Content Library tab. Either drag and drop onto the figure, or double click the item to load it onto the figure. The same applies to Hair items as well. I don;t know what you mean by cutting and pasting accross? Morphs change the shape of the main character, like Genesis or V4. The older ones for V4 are sometimes INJexted using an injection file found in the Poser Formats > Pose folder. Metadata is what populates the Smart Content tab, and you should not normally have to do anything with it. OBJ is a mesh file format used throughout the 3D world. It only contains the mesh information, and in DAZ Studio, you seldom have to load one yourself, it is usually done by running a CR2 (Character) file from Poser Formats > Figures. A lot yes thanks. The difficulty with some items you can buy is finding the file which does the loading of content and why for example I found the word Powrloader so helpful. It's trying to remember all the jargon too for example drag and drop not cut and paste so apologies....! Do not be afraid to post any questions that you may have in this forum, it's what it is for. Most of the content sold here in the store is still Poser format content. Characters (Figures) will be loaded by using a CR2 (Character) file from the Poser Foramts area in the Content Library tab. A CR2 file 'calls' the OBJ file from the Geometries folder, and then supplies the rigging (bones) and materials for the figure. Sometimes you can download files from ShareCG that are in OBJ format so that they can be used in any 3D program, like Lightwave or 3DS Max or Blender etc, and they can be more difficult to use, but there is plenty of help here if you need it. If you want to open an OBJ file inside DAZ Studio, go to File > Import, and the first one on the list is OBJ. Find your file, and DS4P should load it for you. The OBJ file format only carries mesh information, and a link to a texture file. They usually come in pairs OBJ/MTL and DS4P should pick up the textures folder. Any more problems, just post again. That sounds like 'nested' folders, one inside the other in other words. You should only have one DAZ 3D folder in Documents and Settings to hold your content. 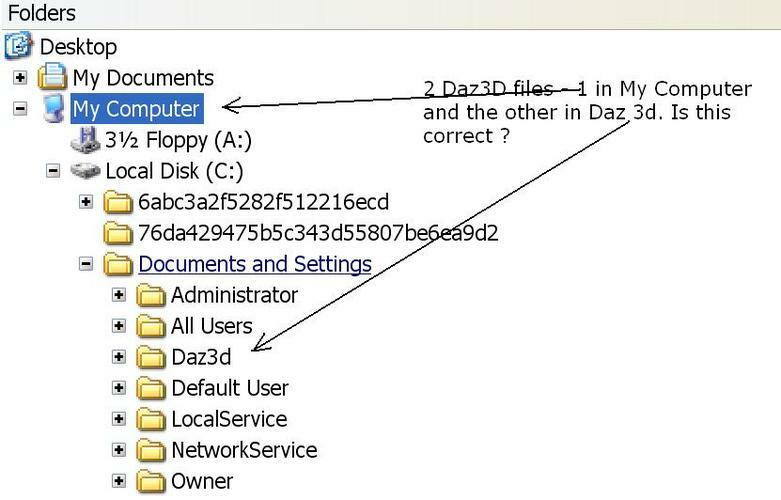 I don't know why you have two DAZ 3D folders, and neither of them has a Content or My Library folder, strange. 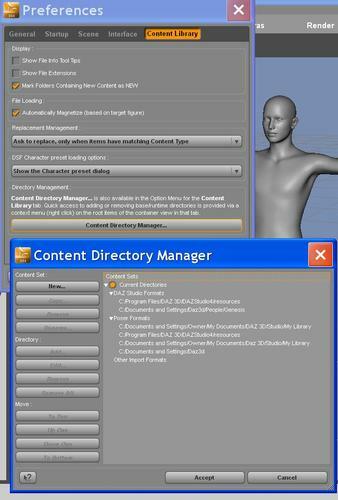 What do you have in the Content Directory Manager listed as DAZ Studio and Poser Formats? Go to Edit > Preferences > Content Library, and post a screenshot if you can. The one in Pic 2 looks like the stuff that the Genesis Essentials installed. What OBJ file are you trying to load, and where did you download it to? All you have to do, is find the path to the OBJ file when prompted by DS, and it will be loaded. It does not need to be in any particular folder. Sorry about this I've had loads of yelling children running around the house all afternoon, now they've gone I double checked and realised that in the first pic I should have said as in the pic below - 1 in "My Documents" and 2, 1 nested, in "My Computer". 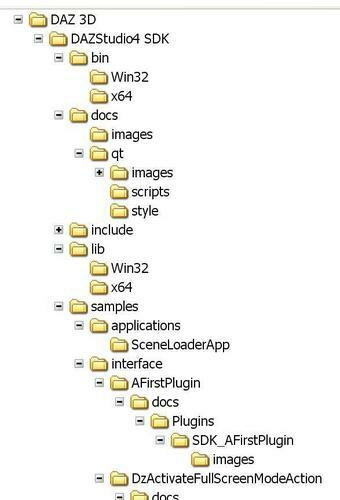 Your DAZ Studio formats are a bit of a mess. Both of them will not show any content in DAZ Studio Formats in the Content Library, and the Poser ones seem to be wrong too. I think the easiest thing to do, would be to reinstall DS4P. 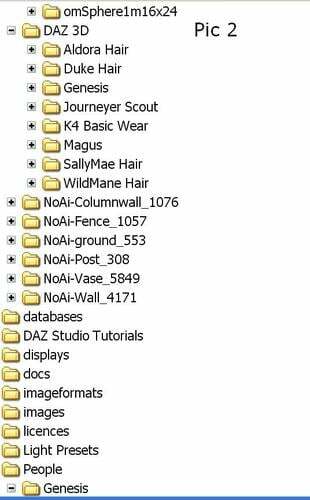 The DAZ Studio program should be installed to the Program Files area, and the content to C:/Documents and Settings/Owner/My Documents/DAZ 3D/Studio/My Library. That is the correct install path for ALL content, Poser or DAZ Studio. If you are using a version of DS4P prior to the 4.5 update, then enter Program files in the top box, and C:/Documents and Settings/Owner/My Documents/DAZ 3D/Studio/My Library in the bottom one. That way everything will be installed to the correct place. The latest update to DS4P, 4.5.0.114, has a seperate installer for the content. If you try to reinstall, the installer should uninstall the previous version anyway. Does that all make sense. It will be easier than trying to fix all the things that are wrong at the moment. It's really dragging on this problem or is it a leftover from the big transition that happened at the end of May....? The best way to get the 4.5 version, is to buy it through the store, and the content will be in a seperate installer. Use this link, and add it to your cart, then checkout. All you need to install is the 4.5.0.114 installer, and the Genesis Essentials installer to the path I gave you earlier. It's getting ridiculous is no-one else having this problem ? Did you put it into your cart, and checkout, or did you download it through another link? Either way, you should have a file called 14812_GenesisStarterEssentials_1.3_trx.exe, which needs to be installed as well, to the content area that I showed you. The latest versin of ds 4.5 requires this file as the Gnesis figure is in the new DUF format and has to be replaced. This is the first time tht a versiion has had a seperate installer for the content. Install the main application (program) into the Program Files folder, and then install the content into the Documents and Settings path that I mentioned earlier, and all will be well. Could you try downloading 4.5 and see what happens in case it's something wrong with my computer ? These are all liks to the downloads. They should also be in your My Account area under Available Downloads, there may be several pages of them to look through. I don;t see why they wouldn't be there. Couple of resulting queries I'm trying to open the main Scene page but the shortcut icon on desktop isn't working. And is it possible to delete all these surplus duplicated files in My Orders as there's now far too many ? By the Scene page, do you mean you are trying to load the program by double clicking on the icon on the Desktop? Does DS4P not load up at all? If that doesn't load the program I'm not sure what is going on. You can right click on the icon and 'Open File Location' or something to that effect. Or look in properties to see where the shortcut is pointing to? The files on the download page are not really duplicates, you will have PC and Mac versions, as well as version 4.0.3.47 and version 4.5.0.114 so that people can download and keep the previous version too in case of trouble with 4.5. They willl go away in a few days, but I'm afraid there is no quick way to get rid of them. You say DS4P I thought I was opening DS 4.5....? Yes trying to start the programme with the silver figure in the centre, the picture/scene with the model's arms raised....don't know what it's called. Tried right clicking on the icon but no "Open file location", just the same message as before "Windows is searching for Daz Studio.ex. or try yourself...." but nothing's coming up. You will have to look for DAZ Studio wherever you installed it to. I thought you said you installed it to Program Files? If that is the case, I don;t know why XP can't find it, or how it managed to create a desktop icon with the wrong address on it? , right click on it, and create a desktop icon, then get rid of the one that doesn't work. DS4P, DAZ Studo 4 Pro, the version number is 4.5.0.11. No trace of DazStudio.exe regrettably, I also did a full Search as per the pic below but still nothing....?? Are you sure that you put the correct item in your cart? I don't know why you would have the SDK, I don't even have it. We'll get there in the end :) Stick with it! I always fancied the idea of sketching, unforunately I have no talent in that direction at all. I could learn a bit, but what I could produce would never satisfy me. It is very hard going from Arts to Science, but it gets easier.